Even today we can still see businesses doing social marketing on Facebook with the help of a personal profile instead of a business page. We hope that this is mainly because they started promoting their products or services on Facebook before the concept of Business pages came along and as they already had “Friends”, who were acquired with hard work, and they did not want to start over with a page. This is entirely understandable. But few people really know that now you have the option to turn your profile into a page. And that is what we are going to talk about today. The biggest advantage of transferring a Facebook profile into a Facebook page, compared to creating a new Facebook page, is that the friends the particular profile has, will be automatically transferred, becoming the page’s fans. The profile picture set up on the profile will be transferred as well, but no other content will be transferred (posts, comments and so on). Thus, you might want to download the data associated to your profile before you start converting it into a page, as the process is irreversible. You also have to note, that Facebook will not let you migrate from a profile to a page, if it does not recognize the browser that you are using to complete the process. So be sure to use a browser that you used in the past to interact on the profile you want to change. 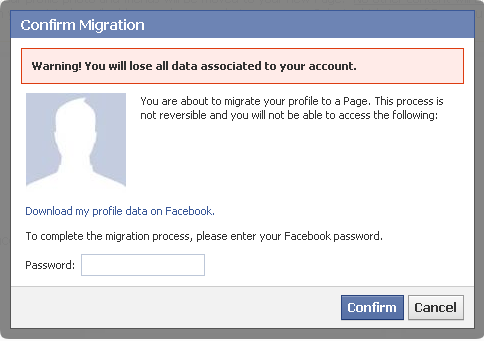 After you decided that this is actually what you want to do, you have to follow the steps in the following link to migrate your Facebook profile to a page: https://www.facebook.com/pages/create.php?migrate. After accessing the above link, on the first page you will have to choose the category your Facebook page will refer to (you will be able to change this on a later time). You have 6 options in this case: Local Business or Place; Company, Organization or Institution; Brand or Product; Artist, Band or Public Figure; Entertainment; Cause and Community. After choosing the category, you might be prompt to choose a sub-category as well. The name associated to you profile will be by default the name of the page and you have to keep it the same or similar to this in order to complete the migration. Note that the name of the page can be changed after the migration process is complete, but only if the page has less than 200 likes. If you have more than 200 friends on the profile you want to change and you want a page with a different name, then the only option is to create a new business page from scratch, in which case your friends won’t turn into fans automatically. After following the mentioned steps, you will be prompt to enter your password in order to confirm that you understand that this process is irreversible (in fact it can be reversed, but only after a lenghty process that involves sending a request to Facebook). Additionally, if you haven’t done it by this point, you can download your profile data. Which you should do, just in case. After finishing the migration process remember to add your personal profile as an administrator. 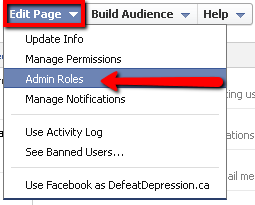 To do this, while on the page, from the upper-right menu choose Edit Page -> Admin Roles and type in the email of the Facebook profile you want to give rights to. Remember that you have to first like your page with your personal profile, before you can add your particular email address as a Manager, Content Creator, Moderator, Advertiser ans so on. This is the rule for anyone else as well, who you want to give Administrator rights to on the page. If you are given administrator rights on a Facebook page, you can post, comment and like on behalf of your page or on behalf of your personal profile. To switch between the two choose the wheel icon in the upper-right corner and click on the page or the profile on behalf of which you want to interact on Facebook. You know that you are acting as the page if in the upper right corner the profile photo and the name of your page appear. As a page you can like other pages as well, which means that a page will have its own News Feed as well (separate from the personal profile’s which is administrating it). You can access it as you access your own News Feed: when acting as the page (see steps outlined above), you just click on the Facebook logo in the upper-left corner. Do be careful and do not comment or post something personal on behalf of your page. So keep an eye for the message bar stating “You are posting, commenting, and liking as…” on which can be observed on top of the website (see below). 1. Profile and Cover Photo. Your profile photo is transferred automatically within the migration process, but you should choose a Cover Photo as well. Please note that both should reflect your brand. A. 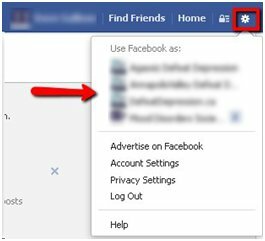 While you’re using Facebook as your profile (not your page) – see instructions in the How to manage your business page section- go on the page you want to invite your friends to. You can do this by selecting the page’s name in the left side of your personal News Feed or searching for the name of the page in the Facebook search box. 3. Another option to build a fan base would be to Like business pages connected to your industry and interact with those particular pages: comment, like, share their posts, share interesting content on their own Timeline and so on. 4. It could also help to place the Like button, or the link to your Facebook page strategically on your website, blog, guest blog articles and other content you can control. 5. It is also important for you to interact with the fans on your page, in order for them to not Unlike your page in the future. This tip is more in the line of not letting you Fan Base decrease, instead of literally increasing the number of Likes. So Reply or Like the comments they leave on your posts, Comment on the posts they share on your page and so on. 6. Finally, if you dispose of a budget you can even use Facebook’s Advertising option to get people to like your page. Are you currently managing a personal profile instead of a Facebook page in order to promote your business on the biggest social network available? After reading this post do you still see disadvantages to transforming the profile into a business page? Let us know your thoughts or questions in the comment section below.